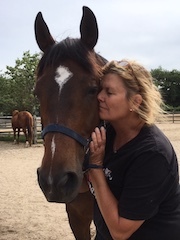 Diane is a Life Coach with a passion for connecting horses with people. She believes the relationships formed with authenticity yields healing energy for all in a very unique and powerful way. She provides a safe, nurturing space in which her clients move through playful and sometimes challenging exercises to open their hearts to more realization of self. In the Heart – Horse work, tears and laughter often surface as discoveries are made! Old stories and patterns may come up with a moment “these don’t really serve me any longer!” Ofttimes new pathways are considered and lives become more peaceful. In addition to Equus Coaching, Diane raised two accomplished daughters , had a successful career of 35 years in education, is a Reiki Practitioner and is currently a student of The Trust Technique. She is affiliated with Spirits Promise Horse Rescue as a Life Coach, Facilitator, and Program Organizer. She is also available for other venues and individual and small group work at stables and private facilities.